This is so beautiful! The cape you made is so gorgeous, and the dress itself is spot on! Absolutely amazing! hahahaha!! ok! I will try harder the next time... (indeed I made her quicker than any doll I made before XD like 30 min max.) I didn't know that you were going to like her that much!! thank you so much!! Oh, my gosh! Gorgeous! Don't stop making dolls on this maker! It's wonderful! 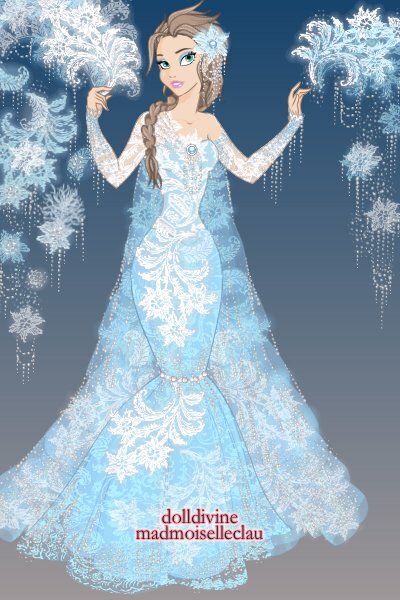 I love the snowflake in her hair, just beautiful! And her cape! It looks like it's made of ice! very nicely done and with more practice this maker is super fun to create on!